Known in the Arab world as the first best selling author of horror and fantasy, Ahmed Khaled Towfik remains largely unknown in the Western world but if producer and director Rami Imam has any say in the matter, that might all change very soon. 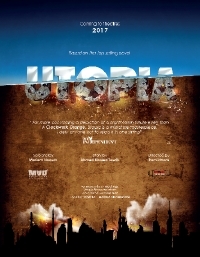 While at Cannes, Imam announced that he was in the process of adapting Towfik's best selling novel "Utopia" which was translated into English in 2011. The story unfolds in 2030 in Egypt of an alternate reality. In this world, the wealthy live in a city called Utopia while "The Others," the poor working class, live in Cairo. The story follows two well-to-do Utopians as they head into Cairo on a sort of "hunting" trip. I'm not familiar with Towfik's work though this review (which is more of a summary of the book than a review) suggests this is a must read for fans of science fiction. The movie will be shot in both Cairo and the UAE and is scheduled for release in 2017. Stay tuned for more updates as they develop.